Driving Miss Donna: Quad Trip Adventures! Wow - did we have an initiation into quad camping, kind of. 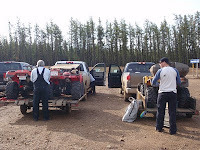 We headed to Fort McMurray on Thursday after work. 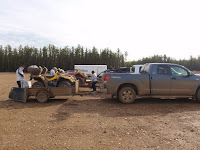 The plan was to stay the night at Lindsay and Jeremy's then all up early on Friday, drive to the staging area and we would be off on the quads. We bought a small tub style trailer to pull behind a quad. This trailer would carry the boat and a few other items, depending on weight. The other supplies, coolers, tents, food and clothes, etc. would get strapped to the quads. 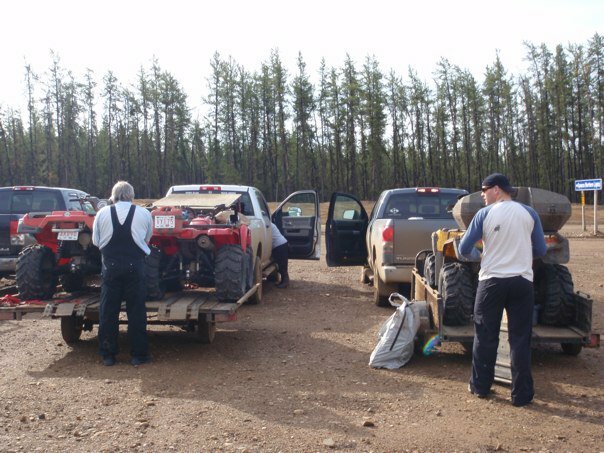 The staging area is 120 km north of Fort Mcmurray, on highway 63. 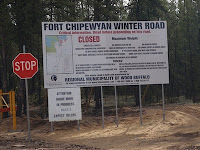 At the staging site is the entrance to the Fort Chipewyan winter road, closed to all traffic except OHV's in the summer. This has you in the most majestic northern scenery, an entire sand road like you have never seen before! You have to cross the Athabasca river to get there. In 1980 when we first lived in Fort McMurray, Don surveyed the road that led to the bridge, which locals called at that time the bridge to nowhere. 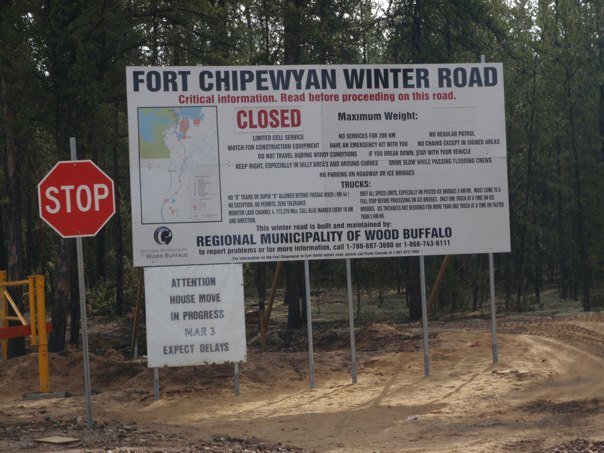 Now that road goes forever, leading to oil sands plants and developments. Anyhow, we left the city in good time, 7:00a.m., and arrived at the staging site at 9:30. We unloaded everything, assessed where it would ride and packed up. We were all excited for the first trip to Richardson Recreational area and the first fishing trip for Jeremy with his new boat in this area. 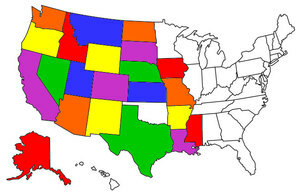 Ever since they moved up north we kept saying we have to go on a quad trip. So we were not discouraged enough to waste the next day. We assessed what we would take for a day trip and loaded up again. The scenery and lake were utterly gorgeous, and I made good use of the lawn chair and my book. Unfortunately my quad ended up with a broken U joint, so we again had to assess the load and redistribute the weight. We thought we would have to end up towing it to the trailer, but it was a trooper and made it all the way out. It's home in the garage now but needs a U joint and a CV boot as well. And - there's more. 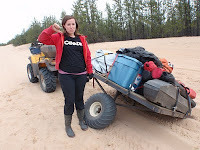 When we returned to the trucks, the quad trailer had a flat tire. So we had to put one quad in the truck, the broken supply trailer on the quad trailer beside another quad, etc. And it was raining. Did I mention the rain on the trail home? Felt like hail on your face most of the time, but didn't rain the whole way. So - I know you won't believe it but the trip was still fantastic. 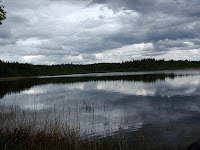 The most beautiful scenery, fresh air and fish. We will definitely be back and make this an annual trip! Have a god week, our next adventure is a simple Father's Day camping trip (in the trailer) to Long Island Lake Provincial Park with the kids. Well that sure sounds like an adventure!! Glad you still were able to make it to the lake and enjoy the beautiful scenery and the good fishing :) We're looking forward to Long Lake! Let's pray to the weather Gods for S-U-N!! !